The Stockspot ETF model portfolios comprise of underlying investments in over 1,400 shares and bonds from Australia and around the world. We spread our clients’ portfolios across thousands of stocks to help reduce risk and balance out companies having inevitable bad years with others doing well. This has helped the Stockspot model portfolios significantly outperform broad Australian shares over the past 12 and 18 months. We take a look into how the investments are spread across regions, sectors and individual holdings to help our clients achieve their goals. All of the Stockspot model portfolios presently have between 65% and 75% of their holdings in Australian shares and bonds. This helps to limit the impact of short-term currency movements on the overall portfolio value. An allocation to overseas investments is also important to reduce the reliance on Australia and benefit from other economies which may be performing well when Australian companies are not. The second highest country allocation after Australia is the US at 4.7% to 9.2% of the portfolios, followed by Asia (ex China), Europe and then China. 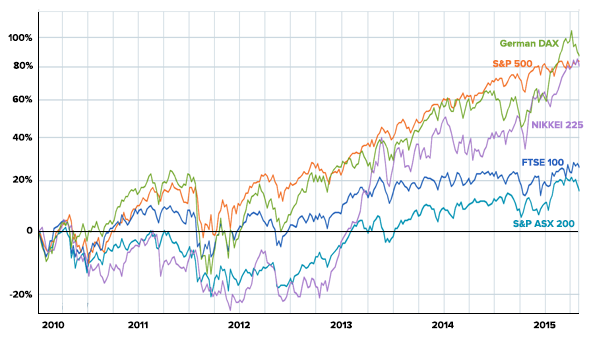 Between 2010 and 2015, most global share markets performed better than Australian shares. This has has benefited those with an international allocation in their portfolio. Even when Australian shares start to perform well again, owning some international shares helps reduce the overall risk. 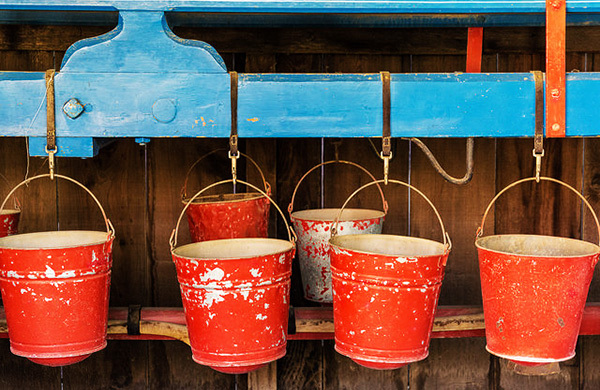 Stockspot clients own shares and bonds across a broad range of sectors. 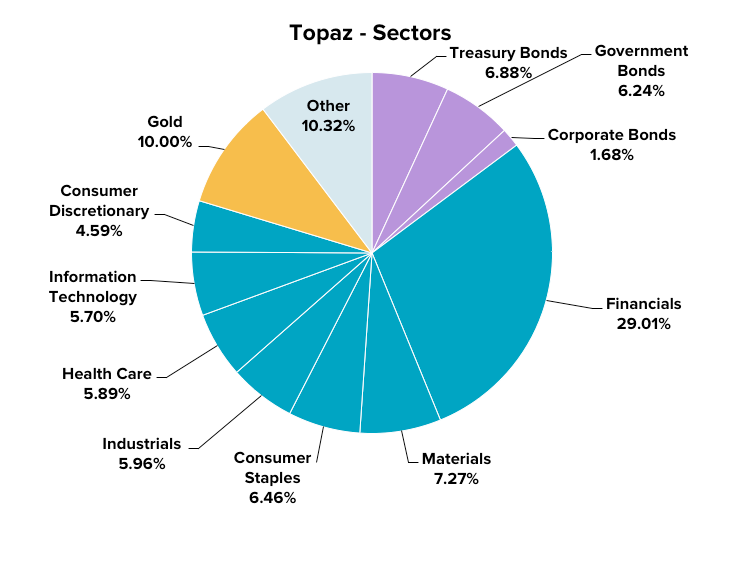 Financials companies make-up the largest single sector of the Topaz, Emerald and Turquoise portfolios. 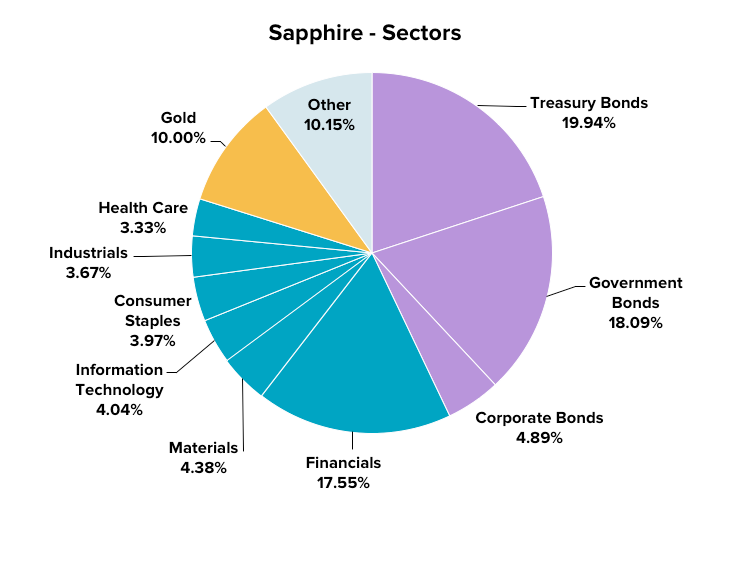 On the other hand, Government and Treasury bonds are the largest components of the more conservative Sapphire and Amethyst portfolios. 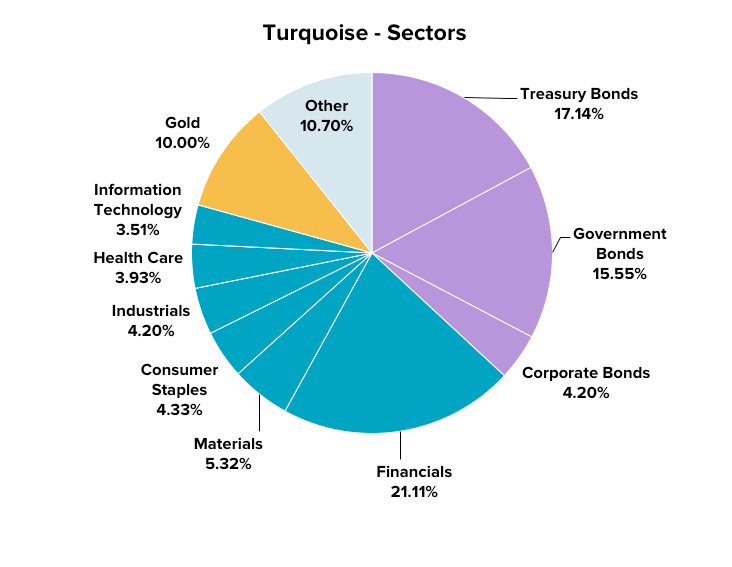 An allocation to global shares means that the Healthcare and Information Technology sectors feature in the Stockspot strategies more than they would in most Australian-only portfolios. Our 10% allocation to gold across all of the strategies helps to reduce risk and steady returns during times of market turmoil. 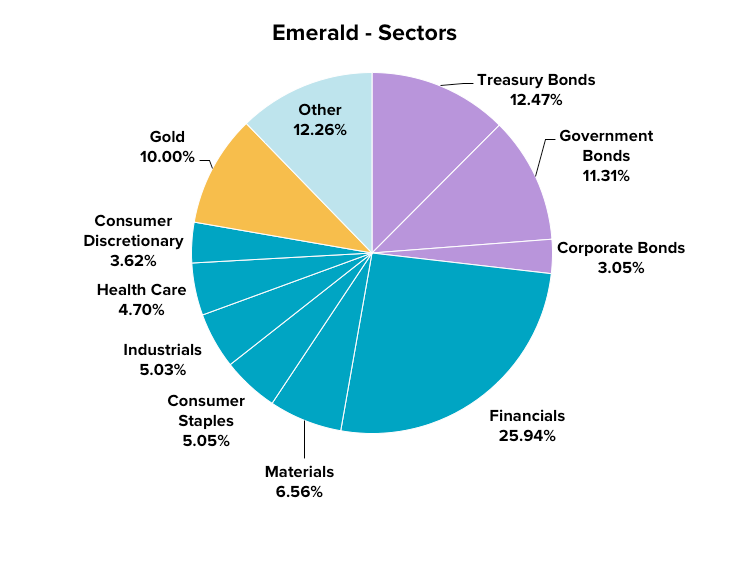 The higher-growth portfolios (Topaz and Emerald) include a majority of Australian shares in their top 20 holdings, plus several bonds and global shares including Apple and Microsoft. 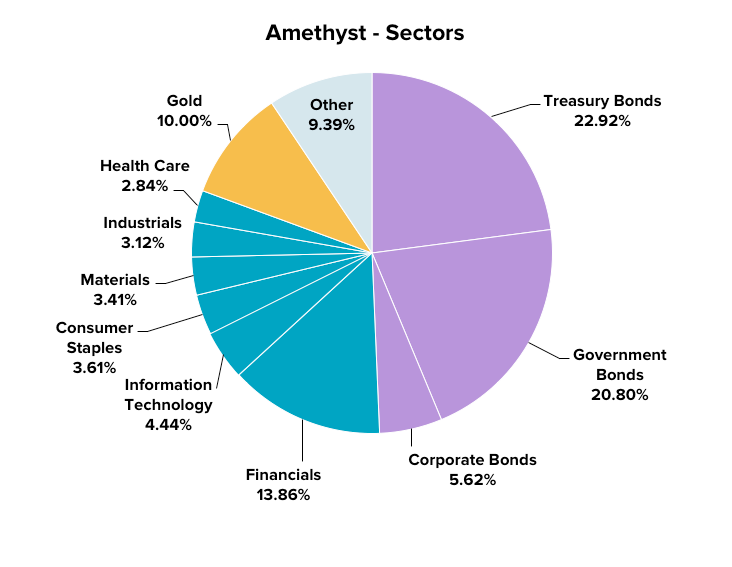 As the portfolios get more conservative, towards Sapphire and Amethyst, they contain higher number of Government and Treasury bonds as part of their top 20 holdings. The Stockspot model portfolios distributed between 3.18% and 3.99% in dividends, interest and franking credits in 2015. As at 10 February 2016, the historical distribution yield of the Australian share ETF (VAS) is 5.7% compared to the distribution yield of the Australian bond ETF (IAF) which is 3.6%. The fees, P/E ratios and P/B ratios are largely consistent across the 5 portfolios. Stockspot is Australia’s most experienced online investment adviser. We make it easy for you to invest in local and global markets. Your money is managed by investment experts with an established track record. We look after your investments so you can focus on other important things in life. Should you buy into smart beta ETFs?